Combine sugar and vinegar in a bowl. Scrape seeds from half of the vanilla bean. Add to sugar mixture. Stir to combine. Add strawberries. Toss to coat. Refrigerate for 10 minutes. Place yoghurt in a bowl. Scrape seeds from remaining vanilla bean half. Add to yoghurt. Stir to combine. 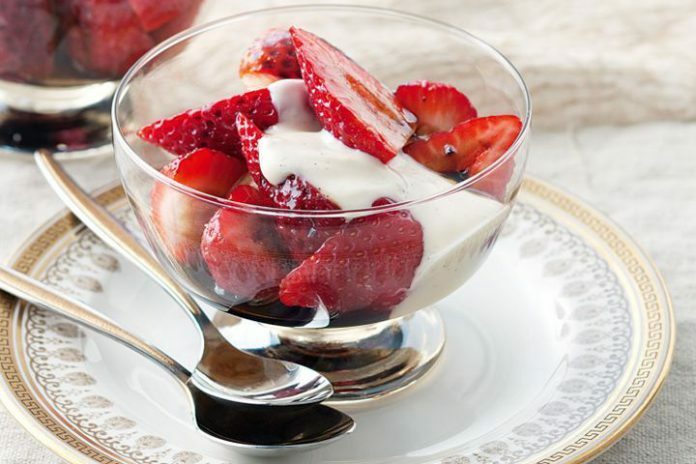 Serve strawberries with yoghurt mixture and vinegar mixture.